He won’t pick up his calls. He is acting distant. He is not looking at you the way he used to. He disappears for long periods of time every day and he rarely checks in. Is he having an affair? The doubt can be too much to handle. You don’t want to invade his privacy but you don’t want to be left in the dark any longer. What can you do? Suffer in silence? Wondering if your husband or boyfriend is cheating on you can be emotional torture. It would be less painful to find out that he is cheating than to be left in the dark. At least you will know the truth. What about her? You have seen her talking to the new guy down the block. You assume it is nothing and brush it off as a casual conversation. Then she stops replying to your calls. She is acting distant. The passion in your relationship seems to be dying. Is cheating? You need to know the truth. The pain of wondering if the one you care about is interested in someone else can feel like a stab in the heart. You have to find out. This has gone on for too long. Is he cheating? Is she cheating? How can you can you come to the bottom of all this and reveal the truth once in for all so both of you can go on with your lives? There is an app called SpyBubble that allows you to spy on your spouse. This is the perfect app for discovering the truth about marital issues. The app can be quickly installed on almost any cell phone. All you need to do is access their phone and install the app. You simply need to download the app onto the phone, install it, check which features you want to monitor, and close the program. SpyBubble will run silently in the background of the target’s phone and upload all cell phone activity to the SpyBubble servers for you to monitor. The installation will be done in less than 40 seconds and you can start monitoring the cell phone activity instantly. NOTE: Unfortunately this program has been discontinued. Fortunately there are many other cell phone spy apps to choose from. Click here to learn more. SpyBubble is one of the best cell phone spying app on the market. You can monitor practically every aspect of a cell phone. Here are some of the many features that SpyBubble offers its clients: text tracking, phone call tracking, GPS tracking, phonebook tracking, photo tracking, web browser tracking, call recording, environment recording, secret picture capturing, and remote control. Several of the mentioned features are only available in the PRO version of SpyBubble. Regardless, the standard version is perfect for anyone who wants to uncover the truth about issues or simply wants to monitor cell phone activity. Another great SpyBubble feature is the ability to upload log reports via a cell phone network connection via sms. In other words, once the app is installed on the phone, it will be able to upload usage reports via a cell phone network. Most cell phone spying apps are designed to upload data only when the phone is connected to an internet connection. If the app can only upload data when there is an active internet connection the data can be outdated and you won’t see live reports. For example, someone could turn off the internet on their phone, send some incriminating messages, delete them from the phone, and turn the internet back on and the spying software will be unable to log the incriminating texts. However, with SpyBubble, the usage data can be sent through a mobile network provider instead of through an internet connection which will make monitoring the phone much easier. Sometimes you have to take drastic measures if you want to uncover the truth about something. Of course, SpyBubble can be used for a wide variety of different purposes such as monitoring a child’s phone or simply using it on your own phone to keep a log of all your activity in case your phone crashes. 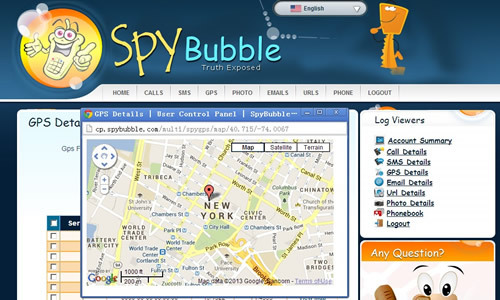 SpyBubble is a state of the art top-notch cell phone spying software. Also is there any application that does not require dealing with the subject’s phone directly? Or do I must install it on the subject phone? What company will you recommend? As far as I know, there is no such app for the Android phone. You will have to download and install it manually on their Android phone. I’d encourage you to read through my review http://www.bestphonespy.com, and select one that has the features you need. How do you install it in the person’s phone? Do you physical need the phone your are monitoring? You will need to access the person’s phone for just a few minutes to install this spy app. After that, you can spy on their cell phone remotely.